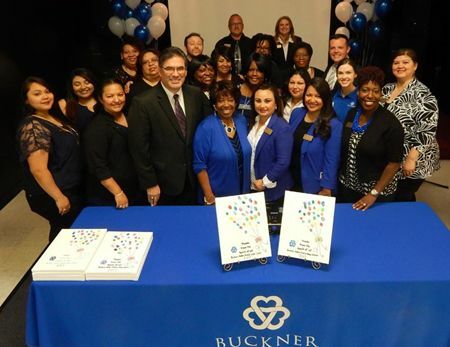 On Thursday, April 27th, over 100 people gathered at the Aldine Family Hope Center, 4700 Aldine Mail Route, to celebrate the 27th anniversary of service to the Aldine community and 5 years of being part of Buckner Children and Family Services. Partners and donors from schools, churches, businesses, government agencies, and local residents came together to celebrate the rich history of Aldine YOUTH and Buckner and the amazing accomplishments over the past 27 years. The Aldine Family Hope Center, originally Aldine YOUTH, was founded in 1990 by Sylvia Bolling out of her home. This grassroots organization and a group of dedicated volunteers operated this organization out of her car and in various locations throughout the community–without funds, staff, or a facility for 5 years. God then blessed them to acquire the 6.8 acres of land and facility, next to Hambrick, where they seeded 25+ programs and services to empower area youth and families to improve their lives. Sylvia, her staff, donors, and volunteers used what they had and were able to make a positive difference, with the support of valuable community partnerships. They were recognized locally and nationally for the thousands oflives changed. Buckner Children and Family Services was founded near Dallas in 1879 by Dr. R.C. Buckner who was moved to serve orphans and widows in distress as a result of the Civil War. Buckner has evolved to meet the ever changing needs of vulnerable children and elders for more than a century. Buckner International is a global organization providing services throughout 13 Texas communities and 8 countries worldwide. They seek to not only meet short term needs, but provide long-term solutions and positive transformation of the families served. In March 2012, Buckner acquisitioned Aldine YOUTH, both having the same goals to support the families here in our Aldine community. This coming together provided the opportunity to grow and strengthen the Center, ensuring sustainability for the programs and services. The Center presently provides over 20 educational, vocational, social, recreational, and spiritual programs for students and families within the Houston and Aldine area. We thank all of the people who attended the 27/5 Anniversary Celebration. Various organizations/churches were recognized for “crossing the bridge” with us from Aldine YOUTH to the Buckner family, by continuing their financial support throughout the 27 years. We also thank the chefs and volunteers from Buckner’s Parkway Place Retirement Center for preparing and serving the delicious lunch, and the Center staff for helping to make the event one to remember. For more information about the Buckner Aldine Family Hope Center or Buckner’s other Houston services and programs, call 281-449-4828. To God be the Glory! !